I have sat staring at my computer for days trying to write. But days or even weeks seem to go by and words just fail me. Between being in an accident where my car was totaled and training and running a marathon and a few half-marathons, one would assume that I would have a lot of stories to share, yet I still seem to be at a loss for words. The last few weeks have been challenging! Trying to buy a car and come to grips with everything that was happening and constantly trying to fight that feeling that every time I take 2 steps forward that somehow I end up taking 5 steps back is overwhelming. I get it, I maybe being a tad dramatic at this moment, but it is all perspective and trying to find the right perspective sometimes is hard, even though I walked away physically unscathed from it. However, even a month later, I still seem to have a hard time sometimes when I am driving, I see a car swerving towards me and I have that moment flash in front of me of being hit. The hardest part for me was going to the junkyard and seeing my car all torn apart that I barely identified it. I never thought of myself as someone who was attached to a car, after all it was and is a mode of transportation, but at that moment, the tears came flooding and it was hard to control. I realized that I had this sentimental attachment to this particular car, because someone I care and love had helped me pick the car. We had a lot of road trips in this and despite the fact that he moved away, this was the one thing that I had that constantly reminded me of him. Staring at it all torn apart at that moment, made it feel like the final nail was hit in that coffin. But fortunately for me, I had a marathon looming ahead and that gave me something to focus on. All that miles and energy and dedication towards it kept me sane and saw me through some difficult days. Race day was finally here and I was nervous. So many questions going through my head, will I be able to finish it in time, beat all the deadlines they gave and most importantly will I cross that finish line standing up? I stand there among the thousands and because of all the uncertainty in my head, I felt like a fraud and that I did not belong there. But the race starts and I keep going mile after mile. I was thankful that my brain nor my body was giving up on me. 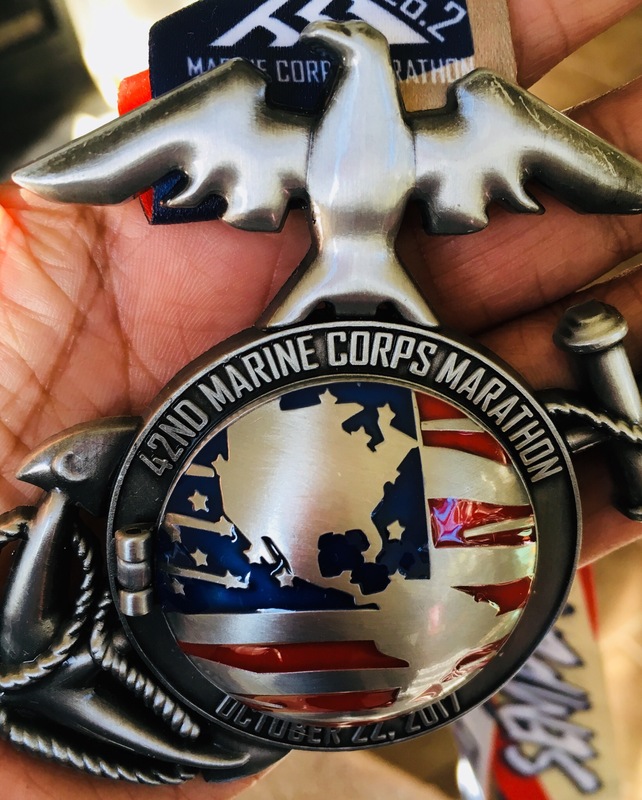 Of course there were times I was questioning my sanity for doing this and telling myself this would be the last marathon I would ever run. But between my music and my random thoughts about everything, I made it across that finish line. Now that the race is run, the finished line crossed and a car purchased life seems to be back on track. Even though I know it is the norm for curveballs to be thrown in your direction and that is life, sometimes it is hard to deal with. Like most people I too, bury my head in the sand for a while, but I typically always pick myself up and continue on to the next challenge. At the end all these curveballs and challenges is what has made me stronger and wiser (some people might not agree with the wise part) or at least I tell myself. 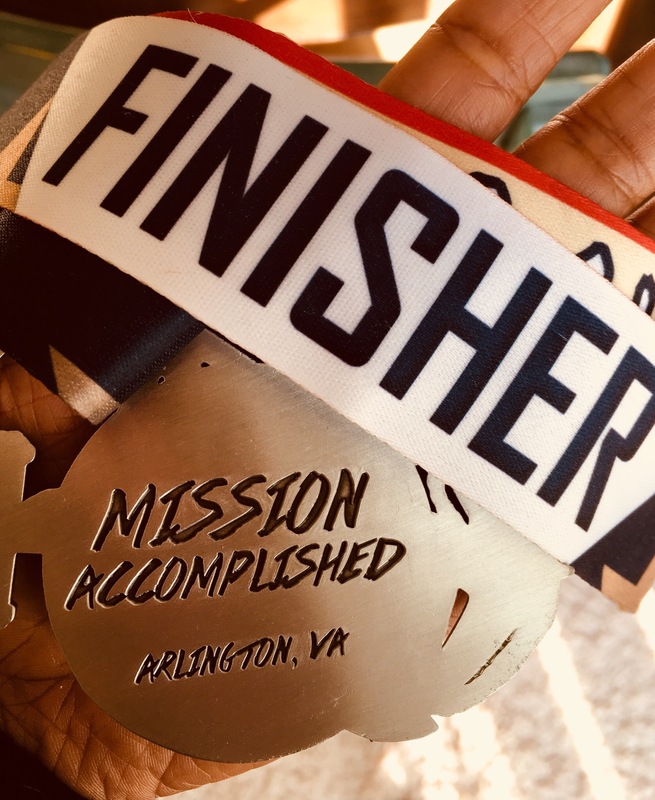 This entry was posted in Life, Running and tagged friendships, life, love, marathon, mcm, motivation, music, personal essay, running, truth, writing. Bookmark the permalink. Thank goodness you weren’t injured in the car wreck! That is a traumatic thing to have to go through! Congratulations on finishing the race! Thank you PJ. I’m glad that I️ walked away without a scratch too. Plus now I️ get to drive around in a new car. 😊 Hope you’re doing well? That is one good thing about it — a new car!! I am so happy that you were not injured!! Oh, I am doing well. Getting ready to go to physical therapy. Beyond the car crash, whenever I finish a big race I feel a disjointed restlessness where I can’t really do any thing. Writing is always my best medicine for this… and setting a new goal. Writing has always been my therapy, but recently I️ find it slipping away and trying to get it back seems tough. But maybe I️ need a new goal to focus on and the writing might come back too. Thank you for reading. ((HUGS)) to you! You are so right, challenges do make us stronger and wiser! I am so glad that you weren’t physically hurt in the car wreck, but I am sure it did traumatize you. And I understand your tears at the sight of your car. Way to keep going and running the marathons. Keep pressing on and be kind to yourself! Give yourself time to bounce back! Thank you so much. It has definitely been a little challenging, but I am so thankful for having walked away without any injuries but also for having the ability to go for a run and focus on that. I think you are indeed wiser as a result of your tenacity. Heck yes, life can be difficult sometime, and although it may appear that you have taken a step back, or that your head was stuck in the sand, it’s obvious that you braved your way through it. I have this saying that has always helped me, so I will share. “Always Tested, Never Beaten.” There’s something about the tests (I think it’s the experience we gain), that makes life worth tackling. So take your hand, place on either shoulder, and give yourself a pat. You deserve it!!! Thank you for sharing your saying. That definitely is going to be one I will be repeating to myself frequently. There is no doubt that the tests are sometimes inconvenient and challenging, but it definitely makes us all learn out strengths and walk away being a better and stronger person. Thank you again for your thoughtful words of wisdom. I think it is normal to be traumatized by a bad car accident, even if you weren’t injured. It will take time before you get over that feeling, so just be patient with yourself. Sometimes life does seem to throw more at us than we are equipped to handle, and when that happens we just need to keep reminding ourselves that we will get through it and things will improve. Meanwhile, I agree that these experiences do make us stronger in the long run! Thank you Ann. Sometimes I think I am too hard on myself and definitely lacking in the patience department. But I try to look at the positive aspects of it and like you said remind myself that it is only temporary and that things will get better. Most often there is a light at the end of the tunnel.